Facebook, PTA targeting child safety, security online with new partnership. 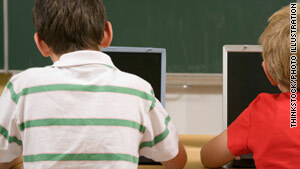 (CNN) -- Worried whether your kids are being safe when they're on the internet? So, apparently, are Facebook and the PTA. The national education group and the social-media giant announced a long-term partnership Thursday aimed at teaching children, parents and teachers about responsible internet use. The collaboration, set to be announced at the Parent Teacher Association's national convention in Memphis, Tennessee, will establish a comprehensive program, on both Facebook and the PTA's website. Topics that will be addressed include cyber-bullying, internet safety and security and "citizenship online," according to a news release. "Nothing is more important to us than the well-being of the people, especially the many teenagers, who use Facebook," said Sheryl Sandberg, Facebook's chief operating officer. Facebook, the No. 1 social media site by a longshot with more than 500 million accounts, requires users to be at least 13 years old. But with no practical way to check the ages of that many people, it's widely acknowledged that pre-teens use the site. That is one of the factors that has left many parents debating whether to allow their children to break the rules and use Facebook, and other social-media sites. According to a PTA report released this week, many children aren't learning online literacy in their schools, and parents say they don't know enough to help them. "Unless new media are used in schools and within families, youth are on their own in figuring out the ethics, social norms and civil behaviors that enable good citizenship in the online part of their media use and lives," reads the report, from a PTA Online Safety and Technology Working Group. Under the agreement, Facebook and PTA also work to bridge what's called the digital divide -- helping minority and low-income families gain access to the tools to become digital-savvy. "Our vision is that each child, parent and teacher will have the knowledge and tools they need to harness the power of the internet effectively and safely," said Charles J. Saylors, that National PTA president. Facebook said its commitment of resources to the project on its pages amount to a $1 million investment. The PTA also will be reaching out to the 24,000 local PTAs across the United States, with the goal of reaching every student in the nation as part of the program. In the coming months,Facebook and PTA will be consulting child-safety and technology experts to collect education resources. Kids, parents and teachers will be surveyed for their thoughts on what's needed.